Posted March 2, 2014 by laurielmorrison & filed under Author Visits, Posts about author visits and Skypes, The Writing Process, Young Adult Literature. It’s a logistical challenge to coordinate an author visit. Especially if the author is coming in from out of town and presenting to multiple groups. And especially especially when there’s a snow day on the originally scheduled date. 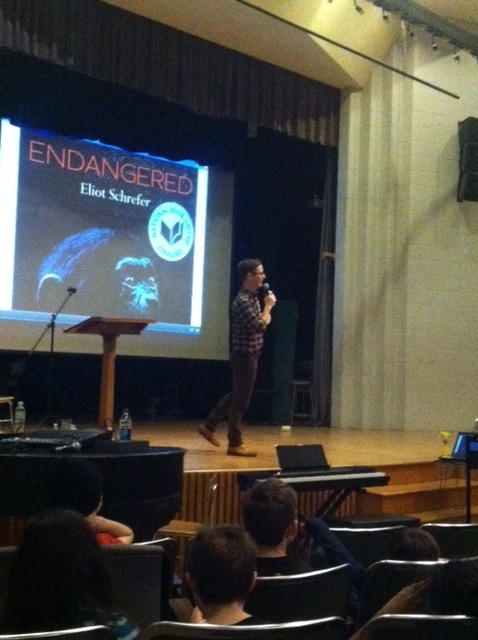 So it’s really saying something that Eliot Schrefer’s author visit on February 20th was worth the logistical challenges and then some! Eliot is the author of the National Book Award Finalist novel Endangered, which tells the story of a fourteen-year-old girl trying to survive in war-time Congo with an orphaned bonobo, and the brand new novel Threatened, among other books. He charmed and inspired middle school students, high school students, and teachers as he presented about human-ape relationships and his research trip to Congo for Endangered. He also talked more informally about his writing process with the eighth grade. I loved hearing about Eliot’s adventures in Congo, and I also appreciated the humble, unintimidating way he described his life as a writer. I thought it was especially interesting to hear about how he came up with the idea for Endangered. He began researching bonobos because of a pair of Bonobo brand pants, and when it came time to write the novel, he started off with the situation for the story in mind. He knew he’d tell the story of a teenager trying to take care of a bonobo during a time of violence and political unrest, and from there, he figured out what kind of character would fit the situation best. It was also interesting to hear him talk about drafting versus revision (he doesn’t let himself look back above the cursor as he drafts and keeps moving forward, and he spends much longer revising a first draft than writing it) and about getting into the writing zone. One of the eighth grade students asked him if he feels like he’s really writing from a character’s perspective when he sits down to write, and he said that sometimes he gets into a flow state, in which the story comes to him easily from a character’s perspective, but sometimes he has to sit down and write even when he isn’t in that kind of zone. My own writing process is different from Eliot’s in some ways: I tend to start a story with a character or a feeling instead of a situation, and I tend to go back to earlier parts of a story a lot as I’m getting a draft together rather than pushing onward without looking back. But the tone of Eliot’s talks made it clear that there isn’t just one way to do things: what’s important is to realize that writing, or any other kind of art, is going to take a whole lot of effort and discipline, and then to figure out what works best for each of us. Oh, and in addition to all of those great takeaways from the visit? Bonobos are extraordinarily cute. Seriously. Look them up on YouTube. In the larger assemblies, the whole audience was enchanted each time Eliot showed a video clip of bonobos. Eliot is writing a quartet of YA novels about young people and their relationships with each of the four great apes: bonobos in Endangered, chimpanzees in Threatened, and then orangutans and gorillas in his next two books. As I looked out at the audience of students and teachers, all smiling and laughing as they watched these emotionally expressive, absolutely endearing apes, I realized that there is something fundamentally fascinating and resonant about these creatures Eliot has chosen to write about. And so maybe that’s the biggest takeaway of all: that the best stories deal with subject matter that is in some way fascinating and resonant. That’s not to say that we should all go out and write about apes–I think Eliot has that under control. But I think we should all be on the lookout for potential topics that speak to us and might speak to others. We should all be on the lookout for our own “bonobos,” and we should be aware that the initial seed of inspiration could come from something as simple as a pair of pants. It sounds like an incredible visit. I wish I could have been there. But since I couldn’t, thanks so much for posting about it, Laurie. Eliot’s process is a lot like mine. I’m so glad your students got a chance to hear him speak and learn about his books.